St Mary’s College Rugby Seven’s team with manager Mark Hurley (left) and coach Tuga Mativa (right). 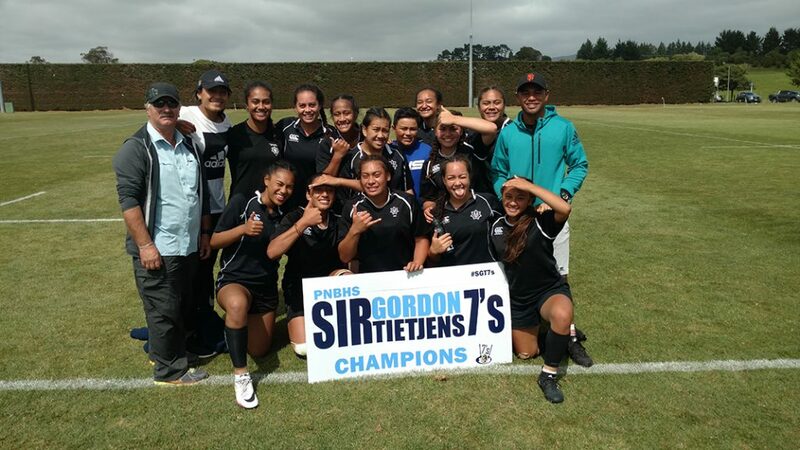 Lyric Faleafaga (in white tee-shirt) was selected earlier this year to join the Olympic Silver-medal winning Black Ferns Sevens on a training scholarship – a major achievement for a school girl. Team members (back l–r): Monica Tagoai, Damaris Samani, Ainsleyana Puleiata, Janaya Lau-Young, Alyssa Wilson, Riarna Vulu, Laina Semu. Front: Katherine Rayasi, Dhys Faleafaga, Renee Savai’inaea, Ivana Samani, Cheyne Copeland. St Mary’s College rugby seven’s team won the Condor Sevens National Secondary School Championship last year. They are the first Wellington team to achieve this championship title. Their win has earned them the right to represent New Zealand at the Sanix World Youth Cup in Fukuoka, Japan, in April 2017. The team has been working hard to raise the $30,000 needed to go to Japan this month. For some families the amount needed to travel is a big challenge. Part of the girls’ success has been their coach, Tuga Mativa, and his friend All Black Ardie Savea. Savea thought he’d go down and help Mativa out occasionally. Instead, he’s there every Monday and Wednesday as his schedule allows. ‘I got hooked onto how good the girls are and how awesome it is to be a part of everything,’ said Savea. ‘When I first came all the girls weren’t talking, they were a bit shy…none of them knew how to pass a rugby ball. St Mary’s College celebrated their team’s success at a special assembly in February this year. Their winning form has continued recently at the Sir Gordon Tietjens Sevens’ Tournament last month.